Call immediately for emergency tree service! When you need reliable tree service in the Greensboro, NC area, rely on Cut Right Tree Service! We do anything from routine tree trimming to emergency tree service! Call us today and let us help you! We understand the importance of having well maintained trees at your property. They enhance your curb appeal, provide shade and add a beautiful aesthetic touch to your yard. Cut Right Tree Service knows how to take care of your trees and keep them well maintained and healthy. Allow our professionals to come in and take care of any tree problems you may have. Our professionals will avoid any dangerous hazards and provide quality tree trimming, maintenance and much more! What sets Cut Right Tree Service apart from the competition? It is our dedication to our customers and how hard we work to get the job done right! Not only will we get to you faster for your tree trimming, but we'll do a more comprehensive job, preparing your trees for the long run as well as the short-term. Unlike many other tree service companies, we'll leave the jobsite totally clean when we're through so you don't have to waste any time picking up. You get beautiful, healthy trees for less hassle and less money. What's not to love? We've been offering the highest quality tree care and emergency tree service to residential and commercial customers in Greensboro, NC for nearly a decade, and we've gotten to be pretty good at what we do. We offer tree service with an eye to both aesthetics and safety. We're a full service tree service company, meaning that we take care of everything from the estimate to the completed project. No matter if you're calling for utility work, aesthetic work or emergency tree service, you can trust our professional arborists to get the job done right. We offer quality tree trimming and pruning to residential and commercial customers all over the Greensboro, NC area. We can make your trees look great while also keeping them healthy for the long run. Our tree removal pros can clear your lot and grind down the stumps so that it looks like no trees were ever there in the first place. We find that many people call on us when they need emergency tree service. As beautiful as some trees can be, one bad storm can turn them from a welcome part of your landscape into an imminent danger to your home and your family. When that happens, there's no time to spare: call Cut Right Tree Service immediately. Our emergency tree service professionals will get to you fast, deal with your issue efficiently, and charge you a fair and affordable price. Don't gamble with your safety: when it comes to tree emergencies, bet on Cut Right. Tree trimming keeps your trees healthy and beautiful! Tree trimming is about more than just beautification. It's an investment in your property. Not only does it provide an immediate boost to aesthetic value and curb appeal, but it's also a surefire way to keep your trees healthy in the long Run. At Cut Right Tree Service, we know a thing or two about how to get the most out of your trees. You can rely on us for your tree trimming needs. To help your trees live long and healthy lives, be sure to call on Cut Right Tree Service. We’ll assess the health of each individual part of each individual tree and provide tree trimming to remove any limbs or branches that are diseased or dying. Our tree trimming services allow your trees to enjoy the longest and healthiest lifespan possible, keeping your property in the Greensboro, NC area as beautiful as ever. Regular trimming of your trees is important for various reasons. Trimming them will improve the look of your trees and also keep them healthy. If there are large branches that may pose a danger to your property, trimming will keep such issues in check. In addition to tree trimming, we also offer other tree-related services for customers in Greensboro, NC and the surrounding areas. For quality tree trimming services, be sure to call one of our representatives today. Cut Right Tree Service is your number one service to help your trees and landscaping thrive. Our job is to enhance your tree’s appeal with excellent tree trimming service in Greensboro, NC. It is our number one priority to provide tree service that enhances your yard, reduces storm damaging risks, and promotes growth of surrounding greenery. For more information on all of our services, including emergency tree service, please visit our website. No request is too big or too small for the professionals of Cut Right Tree Service, so if you only need one tree trimming performed, no problem; schedule an appointment with us. It is never too early to call us for tree service. The health and growth of your residential or commercial property is important to us. If you live outside of the Greensboro, NC area and are looking for help with a specialized project, that is not a problem. The health of a tree and the riddance of dead wood are necessary to let greenery thrive. If you notice branches scraping up against your house or building, overhanging branches over the street, yellowing tree-tops or cracks and splits in a tree, call us today. We will take care of your trees no matter the size of the job. If it is unbalanced or needs a small trim we have you covered with affordable, time-efficient service. We take pride in taking care of your trees with our superior tree service. 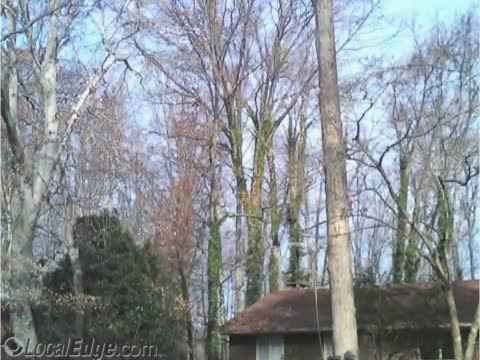 Call Cut Right Tree Service in Greensboro, NC today for any type of tree service you may be in need of. Remember, we are always available for emergency tree service as well! Cut Right Tree Service has provided high quality tree care in Greensboro, NC and the Piedmont Triad area neighborhoods for both residential and commercial customers since 2004. From routine tree trimming and pruning to lot clearing and bobcat work, we do it all. We're here for you 24 hours a day to provide emergency tree service where and when you need it. Call today and let's get started! Pleasant Garden And All Surrounding Areas. I Will Travel To Surrounding Lake And Mountain Areas For Customers.